As part of its corporate social responsibility, Metro Pacific Investments Corporation Foundation, through its Shore It Up program, recently received a donation of 40 eco-reef modules which will be installed in Balayan Bay, one of the country’s top scuba diving destinations. 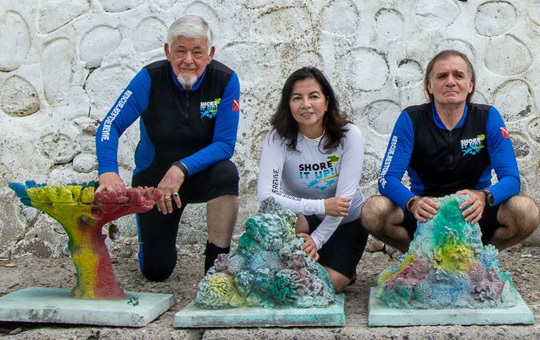 From left: Eco-Mer and Divers Institute of Technology consultant William McGilton, MPIC Foundation president Melody Del Rosario, and marine ecology expert Professor Avigdor (AV) Abelson from Tel Aviv University in Israel. Since 2016, MPIC Foundation has been nurturing a Coral Restoration Field Laboratory in Brgy. Solo in Mabini, Batangas to help restore the marine ecosystem of the area. In the past two years, it has laid 12 modules which have provided valuable data to help in the flourishing of aquatic life in the barangay. Eco-Mer artificial reef units are made of marine concrete which has a better larval attachment, higher survival rates of coral recruits, and wider niche range for higher species diversity, beyond any other commercial artificial reefs. The laboratory serves as an underwater work station for volunteer divers to study fluid dynamics, coral growth potential at Eco-MER units per depth, and other scientific diving related to monitoring and coral restoration for Mabini. The artificial coral reefs undergo monitoring and scientific activities to help enrich the Bay’s ecosystem by setting up marine sanctuaries. According to MPIC vice president for public relations and corporate communications Melody Del Rosario, Shore It Up started in 2009 as a coastal cleanup movement in the Anilao dive spot, and has expanded into a comprehensive marine biodiversity conservation program which covers underwater cleanups, mangrove propagation, giant clam rearrangement, artificial reef restoration, and community livelihood projects. Shore It Up has been held in key coastal areas such as Puerto Galera, Oriental Mindoro; Subic Bay Freeport Zone; Hundred Islands National Park in Alaminos City, Pangasinan; Del Carmen in Siargao Island; Panglao and Pamilacan Islands in Bohol; Surigao City; Medina, Misamis Oriental; and Cordova, Cebu. To sustain these environmental undertakings, the foundation helped establish Mangrove Propagation and Information Centers in Luzon, Visayas, and Mindanao.